Vipralabdha Nayika Casting Off Her Jewelry, India, Himachal Pradesh, Kangra, c. 1850. Opaque watercolor and gold on paper. Harvard Art Museums/Arthur M. Sackler Museum, Gift of Mr. and Mrs. Peter Bienstock, 1974.110. A woman has just discovered that her lover is unfaithful. With head bowed, she casts off his gifts of gold jewelry. She is the Vipralabdha nayika. The Harvard Art Museums are fortunate to house luminous portraits of the Hindu heroines known as nayikas. Each figure’s attributes and emotions correspond to those of her absent lover, or nayaka (hero). Painted in the intricate Kangra style traditional to the Indian state of Himachal Pradesh, the works date to the 18th and 19th centuries. 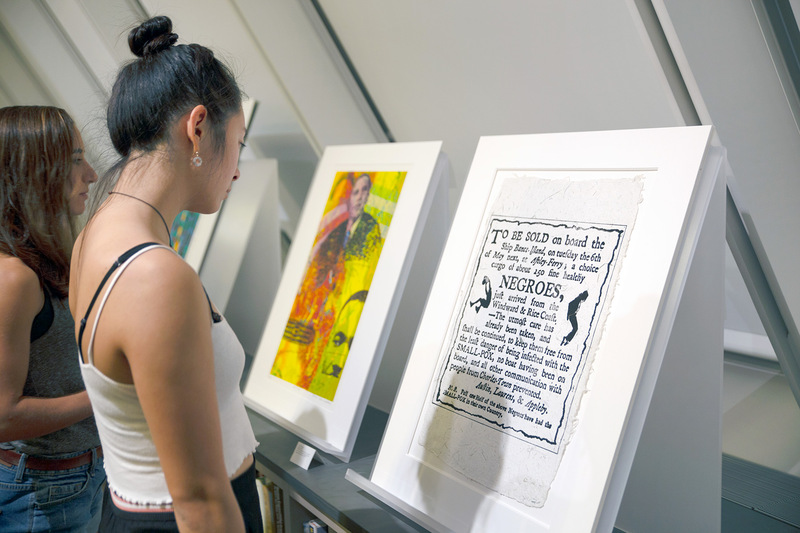 A new installation of four portraits from this genre was curated by Rachel Parikh, the Calderwood Curatorial Fellow in South Asian Art. Featuring opaque watercolors on paper with added gold and silver details, the portraits represent archetypes of love, beauty, and romance. 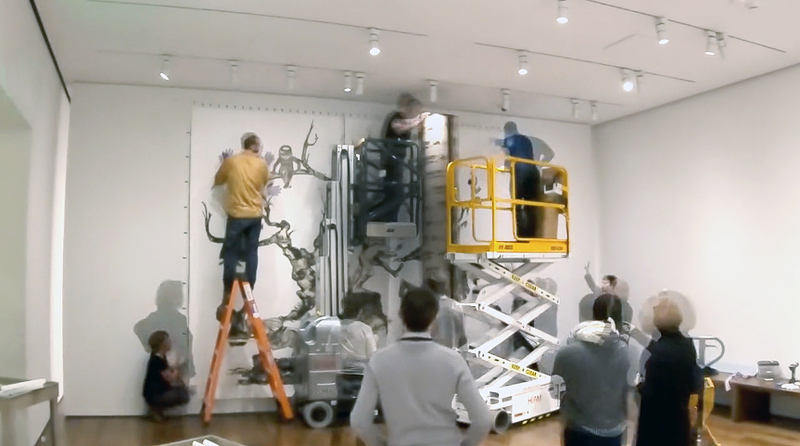 This is the first of two installations dedicated to the nayikas; a second will be on view this spring. of Abhisarika Nayika Entering a Forest, India, Himachal Pradesh, Kangra, 19th century. Opaque watercolor and gold on paper. Harvard Art Museums/Arthur M. Sackler Museum, Gift of John Kenneth Galbraith, 1972.76.
of Virahtokanthita Nayika Waiting for Her Lover on a Winter Night, India, Himachal Pradesh, Kangra, late 18th century. Opaque watercolor and gold on paper. Harvard Art Museums/Arthur M. Sackler Museum, Gift of Suzanne and Frederic Weinstein in memory of Eleanor Dodge Barton and Marjorie R. Hubbard, 1991.179.
of Chitrini Nayika, India, Himachal Pradesh, Kangra, late 18th century. Opaque watercolor and gold on paper. Harvard Art Museums/Arthur M. Sackler Museum, Gift of John Kenneth Galbraith, 1971.127. Harvard’s nayika paintings were most likely once part of an album. “Clues from the framework and composition tell us that,” said Parikh, adding that even though the paintings may have been presented in the album format, they were meant to be viewed and appreciated as individual objects. 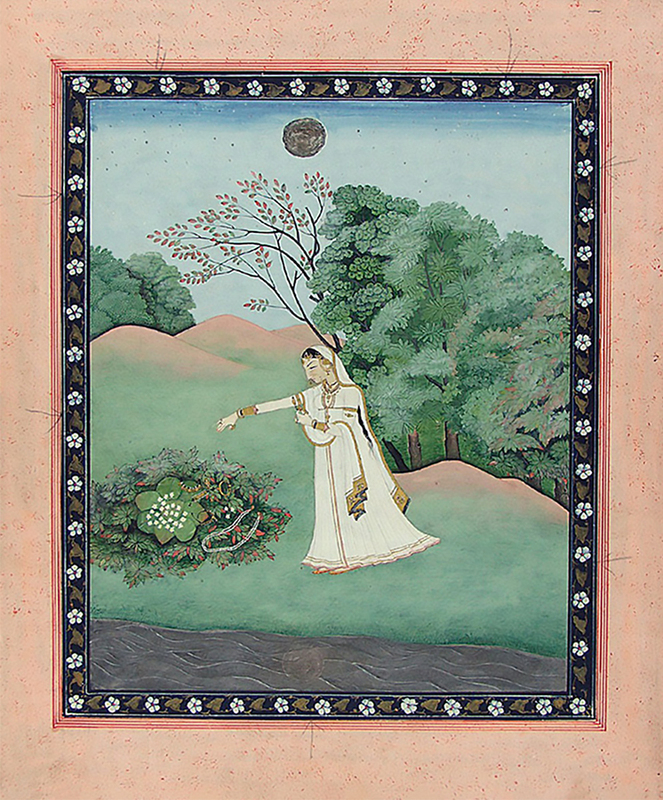 Another of the heroines on display in Parikh’s installation, the Abhisarika (Sanskrit for “beloved”) nayika, is pictured making her way into the woods at sunset while an attendant beseeches her not to. Despite the risk, she sets aside her modesty to brave the forest in pursuit of her lover. “The hand she holds up to her chin seems to indicate her awareness of the dangers that await her,” said Parikh. Parikh hopes that by explaining narrative details and the types of nayikas represented, the installation will start a dialogue for visitors. And with these particular heroines, that conversation promises to be about the intoxicating, and often perilous, nature of love.